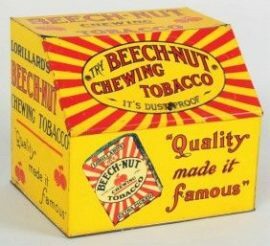 The Beach-Nut Tobacco brand was certainly a household name for many years, becoming one of the biggest selling tobacco brands in the plug tobacco category. In the 1930’s when this bin was made it would be hard to walk into a general store or any smaller merchant and not find Beach-Nut Tobacco on the shelf. The company clearly liked to use colorful advertising, as evident by the counter display in this style, which came in yellow, green, and the more difficult to find and earliest blue painted version. I have always suspected the blue versions were not as colorful, and with some brands, carried the dark plug tobacco version, which was not as strong of a seller as lighter plug tobaccos were. Interestingly, the store bin featured here claims the tobacco was “dust proof”. That was probably true until the container was opened repeatedly by customers, or when the lid was not closed after a packet was pulled out. Dust seems to get everywhere, and I suspect this container accumulated some too! The Beach Nut Tobacco brand was made by the National Tobacco Company still today. Founded in 1897, the brand was originally sold by the Lorillard Tobacco Company, one of the biggest tobacco companies in the world in the early part of the 20th century. STAR BRAND SHOES WERE BETTER BASED ON SALES ALONE!MARCH 17, 2019! ANTIQUE BOTTLE SHOW IN ST. LOUIS. LOTS OF OTHER ADVERTISING TOO!